Simone Forti and Charlemagne Palestine, illlummminnnatttionnnsssss!!!!!! !, 2014. 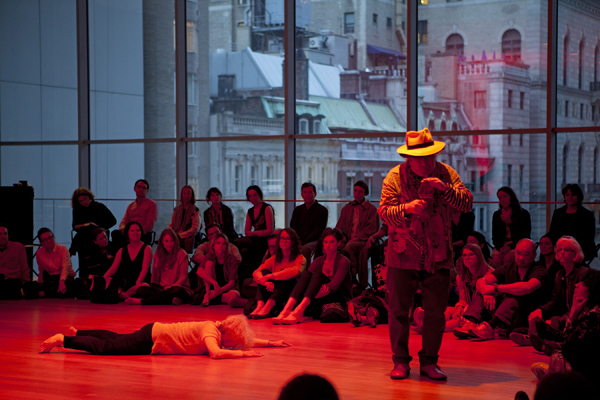 Performance view, Museum of Modern Art, New York, April, 2014. Simone Forti and Charlemagne Palestine. Photo: Julieta Cervantes. It seems terrible to think we are so rote, mechanized in those moments where we imagine a pliable, attentive body. We want to believe ourselves always capable of change; we want our art to be always running after the new. So much of what we call critique is about moving beyond habituation. Though the collaborations between Simone Forti and Charlemagne Palestine are based in improvisation (that old signpost for instantaneous, sui generis creation) they must also be about a kind of lived knowledge, one fought for through endurance. illummminnnatttionnnsssss!!!!!!! after all, is a kind of ritual. (The particular iteration I saw occurred last Sunday in a fourth-floor lobby gallery at the Museum of Modern Art.) And so perhaps there is another way to think about routine, not just as that from which we must be rescued. There is a thin line between modernist negation and industries of self-improvement. As in many rites, it begins with a drink. Palestine dips a finger into the brown liquid and runs it around the rim of the glass, sounding it, sipping it, offering it to us, starting to drone. The noise emanates from only one side of his mouth (the other half still tightly pursed) as if the full thing unleashed would wreck us. It is sharp, abrasive, and mosquito-like, but as he continues it grows capacious. Amplifying in volume, the sound maintains its irritating knife-edge and yet somehow becomes comforting, widening into an embrace. Forti is prone on the floor. Glacially, she begins to roll. Soon Palestine’s attention leaves us and he turns to her, circling hunched and predatory. By the time he gets to the baby grand piano—draped in his menagerie of stuffed animals and baroque schmatta—Forti is putting on her shoes. Now she paces: upright, brisk, determined. This particular ritual has its roots in our favorite mythic wildness: Southern California of the early 1970s. The artists’ first improvisation sessions began in advance of a concert for the teacher Pandit Pran Nath, master of the Hindustani school of music Kirana gharana. Forti got stoned and they worked together, exploring a space they called The Temple. It was a kind of offering, and perhaps that is the key to its reappearance at MoMA, fascinated as we now are with devotion. This messier side of the ’70s, the lawless experiments in living and earnest pursuit of higher planes has not always been easily registered. Sincerity is hard to swallow. Moreover, both artists retain the whiff of outsider-dom, adjacent but just exterior to Minimal music and Minimal (read: Judson) dance; in those worlds but not of them. Pace Agnes de Mille, but the body lies. It betrays you. Its habits are marked by power, to be sure, inscribed within a set of inherited disciplines and techniques, but just as the body is the supreme site of control it is also stochastic, liable to excess and eclipse. So to watch Forti, now in her late seventies, is to watch a body in all its capacities, intelligences, and frailties, and a kind of fierceness in that. To have fidelity in the body, to follow it, to believe in its knowledge is not the same as taking its claims as apodictic. It is a kind of faith. Palestine, after all, began as a carillonneur at Saint Thomas Church on Fifty-Third Street and Fifth Avenue, just shouting distance from MoMA. Less than a month ago, he packed listeners into a Brooklyn church (a place I imagine, like me, much of the audience had not entered in some time). And surely the museum—especially this one—has always been a place of worship. The difference now is what and how we worship. The shoes come off, and Forti drags out two large sketchbooks. It is the stuff this building’s walls are made of, graphic marks done on the floor, but here without the promise of masculinist actualization. A heavy, audible sigh, and she crumples. Raising her torso abruptly, she announces, “the moon,” stretching the syllable into a coo. Half the audience follows the direction of her gaze. Palestine is now at three electronic keyboards and the sounds escalate, denser and more thickly layered, gravelly and refracted. Forti is moving deep in plié, weighted by the aural saturation. A few moments later, she instructs us more directly: “Turn and see the moon.” Nearly everyone complies. We look through the museum’s glass façade and toward something luminous. When was the last time you did that? Forti begins to sing in what could be Italian. (The logics of dancer and musical accompaniment have no place here.) This is the kind of song your mother hummed while doing dishes, the kind you know without ever having learned. Palestine joins in, and arm-in-arm they stride, not quite harmonizing, yet somehow in sync. Their pace quickens and their voices mutate into a bawdy, rousing chorus, a bar song for closing time. To take us out, Palestine squeezes the bellies of two plush creatures, which make their own kind of tune. Their process Forti attributes to Palestine’s way of letting the music develop only gradually. Drones, sustained tones, built up like the body’s mechanisms of intelligence: through duration, a refusal to let go, chronic and unrepentant. Catherine Damman is a writer living in New York. Simone Forti and Charlemagne Palestine’s illummminnnatttionnnsssss!!!!!!! was organized by Stuart Comer and Ana Janevski with Leora Morinis and ran April 13–14, 2014 at the Museum of Modern Art in New York.